• Three resorts in one. • Mandalay Beach pool and lazy river. • Ample dining and entertainment options on site. • Not all rooms have fridges or coffee pots. • WiFi quality is hit and miss. The Mandalay Bay, in all three incarnations, is an elegant resort. It's one of the few resorts where you find locals filing through on a regular basis if for no other reason than to catch major concerts at the House of Blues or taking day trips with their kids to Shark Reef Aquarium. We suggest the large and recently-renovated suites at Delano if you want to stay at this property. Mandalay Bay encompasses three resorts under one umbrella: Mandalay Bay, Delano (formerly THEhotel), and Four Seasons. It was one of the first upscale non-themed resorts to appear on the Strip. It was built in just over two years in the ashes of the Hacienda hotel which was demolished at the site on New Years Eve 1996. Rooms: 4752 total. 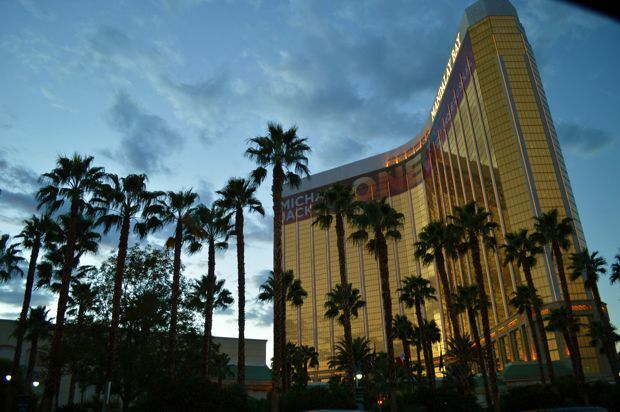 Mandalay Bay has 3211 (includes 436 suites), Delano offers 1117 suites, Four Seasons has 424 rooms. The video below is from late 2014 and tours the entire perimeter of the Mandalay Bay, including the Shoppes at Mandalay Bay. It begins at Fleur by Hubert Keller and proceeds in a counterclockwise path toward the hotel lobby. Here, the video passes a series of shops before arriving at the House of Blues, which in turn leads into the Shoppes at Mandalay Bay. At the top of the escalator, you’ll find the Minus5 bar and Rick Moonen’s RX Boiler Room. The row of shops leads to the end where there is a passage to the Luxor. The video then backtracks back to the escalator and continues through the resort. We approach the Race & Sports Book and the Michael Jackson “ONE” theater. Beyond that is the entrance to Delano. Heading back to the resort, we pass the Light nightclub, Lupo by Wolfgang Puck, and a few other shops until we reach the events center. Here we get a glimpse of Mandalay Beach, a food court, and finally the Shark Reef. Walking the entire of the perimeter of the Mandalay Bay property is one of the longest single-resort strolls you can take in Las Vegas. The video uses 4x speed to zoom through the areas of little interest, and the audio is replaced by stock music in segments where copyrighted music may be playing. Shark Reef Aquarium: This 1.3 million gallon tank is the third largest tank in North America. It allows visitors to walk in a tunnel through the massive tank. There is also a jungle featuring exotic reptiles. Over 100 different species of animals can be seen. House of Blues: Concert venue featuring popular music acts. Mandalay Beach: This 11-acre pool features a lazy river, wave pool, waterfall, and real sand beach. Minus5 Ice Lounge: Have a drink in -5 degree Celsius temperature. Glasses are made of ice and patrons don parkas. Las Vegas is home to two of the world’s four Minus5 locations. Foundation Room: A plush velvety lounge with an outdoor deck with a stunning view looking north up the Strip. The Shoppes at Mandalay Place: Features 40 venues with an assortment of offerings specializing in everything from food to socks. The Michael Jackson ONE theater resides near the entrance to the Delano. Offering panoramic views and floor-to-ceiling windows, Delano is the refurbished, redesigned, and re-branded “other tower” that was THEhotel from 2003 until September 2014. If the name sounds familiar, you may recall a hotel in Miami by the same name, and this Delano references its East Coast cousin around every corner. Delano Las Vegas makes architectural references to its Miami counterpart. I was also told that miX Lounge, which remained unchanged throughout the transition from THEhotel to Delano, would likely be re-branded in the near future. I was told that Delano would eventually have its own pool. Be sure to read my full review of the Delano King Suite while it was still in the preview phase before the official launch. Although at first glance one may suspect the Four Seasons is a separate entity, it falls under the domain of the Mandalay Resort. Unlike Delano – which shares many of the resources of the Mandalay Bay Hotel – Four Seasons is self-contained, offering its guests their own access, pool, gym, and spa. There is a lot to like about the Mandalay Bay. A walk around the perimeter of this massive property can be an event itself. It is one of my favorite places to take a “staycation” because it offers everything you’d want from a full-service resort in one package. The main draws for me, however, are the stunning views offered by Delano and Mandalay Beach, which is about as close to being at a real beach as you will find in Las Vegas. The Beach also occasionally hosts concerts featuring such bands as Everclear, offering a unique venue to enjoy some great music. The Shoppes at Mandalay Place has the feel of a mall, with some standard apparel shops, joined by some rather bizarre venues such as “Flip Flop Shops.” This is also where you’ll find the Minus5 Ice Lounge. The direct passage and free tram to Luxor and Excalibur are a plus, but certainly not a game changer. The TripAdvisor user ratings for the three Mandalay properties are curious, with ratings of 37th, 23th, and 3rd for Mandalay Bay, Delano, and Four Seasons, respectively. As I have noted elsewhere on this site, one must take the TripAdvisor ratings with a grain of salt, unless you believe that a seedy motel could possibly rank above a Strip mega-resort – which does happen on that site. The Mandalay Bay, in all three incarnations, is an elegant resort. It’s one of the few resorts where you find locals filing through on a regular basis if for no other reason than to catch major concerts at the House of Blues or taking day trips with their kids to Shark Reef Aquarium. From a purely local perspective, the location of the resort at the end of the Strip makes it easy to access without being stuck in traffic among buses and cabs. The map below shows the location of the Mandalay Bay, at the south end of the Las Vegas Strip.